Do Felda’s lost billions compensate for the absence of the pink diamond? 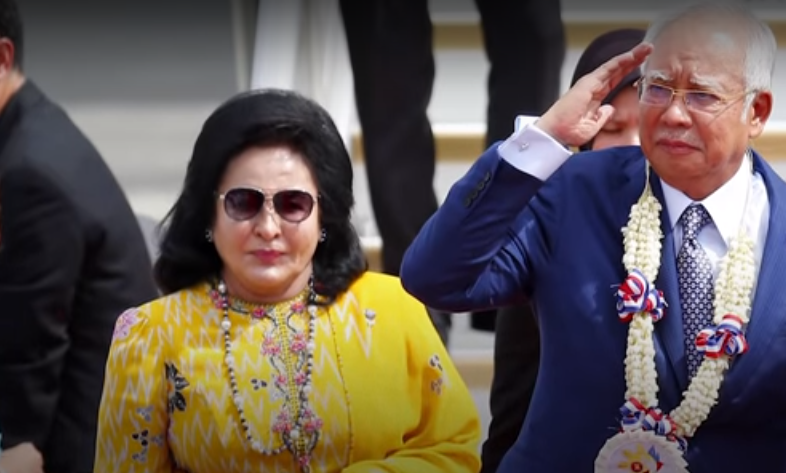 The Najib Razak camp scored a slim victory over reports his wife Rosmah Mansor did not buy a pink diamond as claimed by their opponents in the Pakatan Harapan (PH) government. However, the victory was short-lived for the former prime minister who leaked paragraphs of the embargoed white paper on the Federal Land Development Authority (Felda). This has landed him in trouble with parliament and he is facing a long suspension from the august house of representatives. The white paper exposed the extent of losses incurred by Felda under Najib, a prime minister whose political legacy seems deeply disturbed by a string of financial scandals. From the 1MDB disaster to the allegations of manipulations of the distribution of profits from the Tabung Haji Muslim holy pilgrimage fund management company, does the absence of the pink diamond cleanse the former PM’s image? It is already tough for Najib to explain the RM2.6 billion of money found stashed in his private Islamic banking account. In 2016, a widely-published report from Switzerland’s chief prosecutor revealed that a criminal investigation into state fund 1MDB, or 1Malaysia Development Berhad, found that about $4 billion appeared to have been misappropriated from Malaysian state companies. The Swiss Attorney-General Michael Lauber says his office had identified four cases of the alleged criminal conduct. We know the story of the missing billions from 1MDB, and how it went to various accounts outside and within Malaysia through complex financial structures. For example, news reports reveal how the masterminds behind 1MDB duplicated the names of international private firms to make them look like the original entities as a ploy to divert billions away from 1MDB. From Felda, we now hear how the settlers agency entered into various luxurious projects and inflated contracts under the previous government. What happened at Felda highlights a “massive fraud”, say pro-government observers. PH leader Anwar Ibrahim is asking Felda to explain the RM140 milion spent by its former chairman Tan Sri Mohd Isa Samad on luxuries such as overseas trips with family members. The white paper published by PH says the “put option” in Felda’s deal to gain a 37% stake in Indonesian planter PT Eagle High Plantations Tbk (EHP) from PT Rajawali is not as straightforward as it seems. The white paper also says Felda has made several bad investment decisions. It says when Felda’s board approved the acquisition of EHP shares via a special-purpose vehicle at the same price on Dec 7, 2017, EHP’s market price was even lower at US$0.0098/rupiah 135 per share. Felda agreed to buy EHP shares 344.12% higher than its market price at that time. Najib is defending the EHP deal but the exposure is a political victory for the PH government amid the loss of glitter over the pink diamond. The pink diamond story created a sensation in Malaysia and contributed, to a certain extent, in the demonising of the then “first couple” of Malaysia. From the stories of “bomoh” (shamans) and Rosmah’s “invisible” powers (when she allegedly tried to win favours from Dr Mahathir Mohamad before he swept to power in 2018) to the pink diamond and the allegations of massive spending on luxury items (some found in residences allegedly used by the couple with millions in dollars and ringgit stashed in boxes), the Najib saga does not seem end. Nevertheless, PH has won a part of the battle of perception with the Felda exposure. 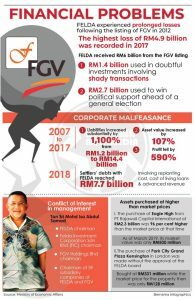 The hundreds of vehicles bought by the previous Felda management under Najib’s administration, the billions lost in Felda Global Ventures (FGV) and the pain this is causing Felda settlers risk burying Najib further. Pink diamond or not, the Najib-Rosmah saga is unfolding with untold consequences for the two protagonists who were once the top political authorities of Malaysia. Forensic studies conducted by Ernst & Young on Felda shows the asset value of Felda’s eight investments, which cost the group some RM4.4 billion, has dropped by 50% to about RM2.2 billion based on information in its audited accounts. This is coupled with inaccuracy in the company’s accounting reports in the last few years. Anwar’s statement on Felda shows how the money was floating in the hands of the office bearers, causing the prime minister-in-waiting to say the office of the Felda and FGV chairman is apparently three or four times better than the prime minister’s office in Putrajaya. Anwar urges PM Mahathir to visit the offices of Felda since this may get him to move his office there, which is far superior. All this was done with settlers’ money, and the settlers have to pay for it. The Malaysian government says it agreed to demands by Felda to pump RM6 billion in the company, but no one can say if this will be a new beginning for Felda.